Watching people open their Christmas gifts brings such a joy to my day but then the dreaded it takes batteries always happens and it just crushes the enthusiasm. Remember to stock up with Duracell this holiday season to avoid the disappointment that comes with not having enough batteries to power all those amazing gifts you purchased. 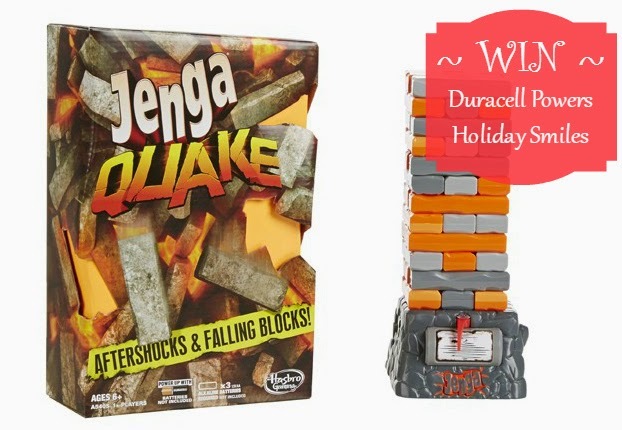 Duracell in partnership with Hasbro would like to power your smiles by offering one of ItsJustMyLife... Canadian readers the opportunity to win this season’s must have toys and the Duracell Quantum batteries to power them. The JENGA QUAKE game will have players shaking from excitement with this all-new version of everyone’s favourite classic wood-stacking game. The pieces sit on a moving base that shakes and quakes during game play for added challenge and excitement. Build the tower as tall as you can without it all falling down on your turn! Disclosure: By entering the following contest you are accepting that if you win your contact information will be shared with a P&G PR and shipping agency for the purpose of mailing your prize. Please allow 4-6 weeks from the contest closure date to receive your prize. This giveaway may appear on other blogs as part of the #PGmom program. However, to be fair, you can only win once per giveaway. If your name is chosen more than once, another winner will be selected. All winners must be from within Canada. Please note giveaways are only open to Canadian residents, excluding Quebec, and will not be sent out of the country.